The goal of this project was to build and implement an inverted pendulum balancer, in the vertical two dimensional plane, using Proportional-Integral-Derivative (PID) feedback control. The inverted pendulum balancer is a radio controlled car modified by adding a plexiglass platform and an inverted pendulum with free rotating pivot. The electrical component of the balancer brings together computational hardware (Atmel Mega32 microcontroller), an input angle sensor (US Digital Optical Shaft Encoder), and an output motor driver (National Semiconductor LMD18200 H-Bridge) onto a single board whose sole purpose is to autonomously control the motion of the car in order to keep the pendulum from falling. Motivated by the School of Mechanical & Aerospace Engineering’s Feedback Control Systems course at Cornell University, our desire was to integrate the knowledge of stabilizing an unstable system using feedback control (MAE478), the fast, flexible computing power of microcontrollers (ECE476), and the use of real-world engineering tools and budgetary constraints imposed on us by project managers. The result was a simple, cheap, and fun device that completed our desired goal. Our motivation originated from Feedback Control Systems (MAE478), a course that we are both currently enrolled in. We wanted to attempt at a project where we could implement a feedback controller with a microcontroller. The question was what to control. After doing some research, we found a Stanford University EE281 project by Geoffrey Bainbridge. This "Self-Balancing Robot" project attempted to design a one-legged robot which balances itself using a feedback control with Atmel Mega163 microcontroller. Bainbridge attempted to balance a rod directly connected by two wheels. He quickly added a third supporting wheel and pivot after the two wheel design created unwanted rotational motion about the vertical axis. In addition, Bainbridge used a tilt sensor to measure the robot’s angle. However, the tilt sensor proved to be inaccurate due to the combination of the robot’s horizontal acceleration and the arm’s gravitational freefall. The basic structure of the feedback control system is shown below. The angle sensor reading is subtracted from the reference angle to produce the error. 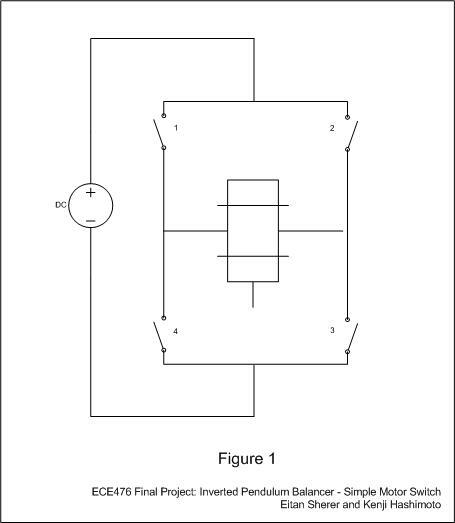 This error is used to calculate the motor control parameters using the PID algorithm (discussed below). The motor control is then sent to the device. We decided to keep our feedback control system SISO (single-input single-output) instead of MIMO (multi-input multi-output) for simplicity to help with our black-box modeling. The reference angle is the only input to the system, and the feedback control uses the error in angle from the reference and calculates a motor output. Our limited mechanical engineering ability, along with the short timeframe to complete the project, favored the use of a prefabricated car. A four-wheeled vehicle would not experience the rotational motion that Bainbridge encountered in his project. RadioShack’s extensive selection of toy Radio Controlled cars made our selection process very easy. Once a stable vehicle with fast response characteristics was discovered and modified to hold an inverted pendulum, the search turned to finding a reliable, high-resolution angle sensing device. The two most viable choices were a MEMS accelerometer or optical encoder. After initial testing, the analog accelerometer could not perform as well as the digital encoder. 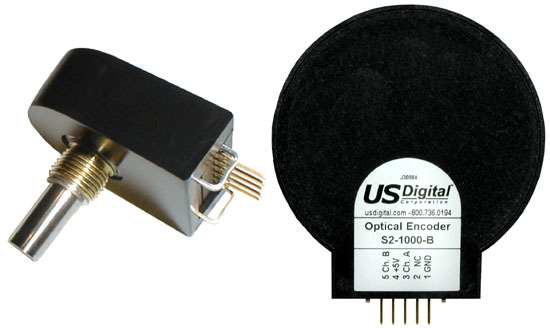 Therefore, the 1024 cycles per revolution (CPR) optical shaft encoder from US Digital became our angle sensor. This is a vast improvement over the tilt sensor, as the encoder was not affected by the effects of gravity or the car’s acceleration. The Atmel Mega32 microcontroller was used instead of the Mega163 due to its superior speed, for external interrupt sampling of the encoder data, and more versatile timer options. Initial black-box testing of the car’s DC motor capabilities gave us a good idea of the car’s performance. Different driving scenarios were observed, including single-direction driving and oscillatory motion. Upon finishing motor control, we moved on to testing the sensor. The optical encoder’s input signals were quickly converted to an error angle referenced from its initial count value. The final design stage was the Proportional-Integral-Derivative (PID) Controller to relate angle error to motor velocity and direction (see equation below). The proportional term (A) applied a voltage to the motor proportional to the error. This value affected the cart’s response time; higher the proportional term, the faster the car’s response at the expense of system stability. The integral term (B) would correct any steady-state error that would occur due to any sluggish response by the motor. Integral control would give the motor a little extra “push” to ensure correct tracking of the reference angle. However, a higher integral control term would create oscillations that are either unrecoverable or may throw the system to instability. Finally, the derivative term (C) is used to smooth out changes in error over time. This term can usually smooth out the oscillations in the vehicle at the expense of slower response. Fine-tuning of these three variables according to system behavior will allow the car to balance the inverted pendulum. Hardware Deisgn - The hardware required for the inverted pendulum balancer can easily be separated into 2 subsystems: Mechanical and Electrical. Our first priority was to quickly acquire a device capable of forward and reverse motion, with quick transitions and fast acceleration. Lacking the knowledge of mechanical cart design and the ability to gear a motor correctly for sufficient torque to move the cart, we quickly adopted the idea of using a radio controlled car as our base. 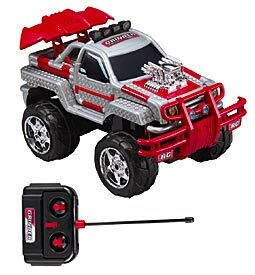 After testing various RC cars from RadioShack, we found a car that seemed to have the performance we required, along with a sturdy base which would easily allow for a pendulum apparatus to be installed. The vehicle’s DC motor was located in an easily accessible location at the rear underside of the car. Six AA batteries were the manufacturer’s defined power source; therefore, we knew our power supply would have to supply at least 9 volts. The six AA’s were installed with a break in the last contact of the battery holder and an ammeter (DVM set to measure current) in series to measure the current drawn by the device. With the car not under load (i.e. not on the floor with the wheels in the air), the device drew 300 mA. We estimated that under load, the car would require at least 600-800 mA to run with enough power. After rummaging through many power supplies in the Phillips Hall Digital Lab, we found a 12v 1500mA power supply from RadioShack, which would be more than enough for our needs. It was later discovered that under load and quick transition in motion, the device actually drew approximately 900mA from the supply. Upon choosing our device, our next task was to build an inverted pendulum on the car. A Plexiglas plate was used to create a platform on which to attach the pendulum (see Image 9 ). This plate was secured to the car with 4 bolts at each corner of the vehicle. 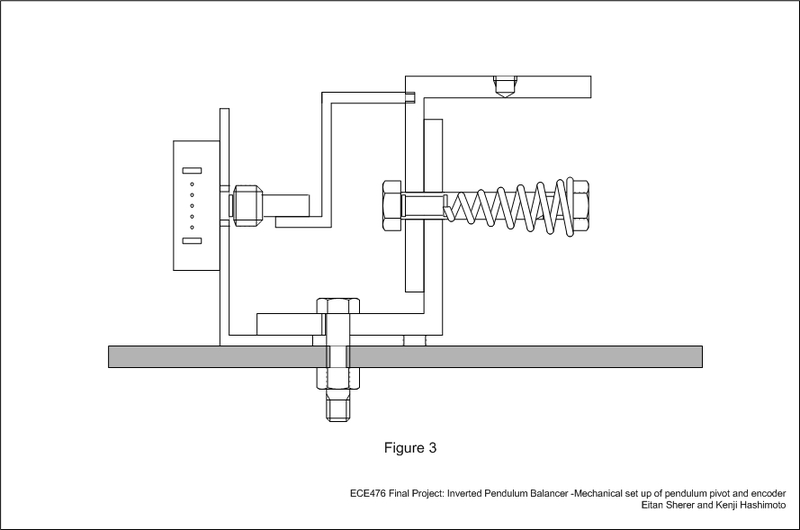 At the center of the platform, two brackets were placed with their inside angles touching each other, connected by a ¼” screw, and used to create the pivot of the pendulum (see Figure 3). Finally, a 38” rod (3/8” diameter) was screwed into the center of the top bracket to create our pendulum. It would seem strange to have a 38” rod above a 12” car. The rod’s height, by design, however, acts in our favor, as the larger moment of inertia (and higher center of mass) actually slow down the rod’s initial movement. The added weight to the vehicle would amplify the unwanted effects of the car’s suspension system. Therefore, four elastic bands were placed around the car in order to lock the shocks in a compressed position. With the pendulum sitting on the top bracket, and the screw acting as a pivot, our next task was to be able to detect the angle and direction of the pendulum’s tilt. Our first option was a MEMS accelerometer from Analog Devices, ADXL202E. However, initial tests proved that the accelerometer’s analog signal would not provide us with the resolution that we required for angle detection. The digital output of the leadless, surface mount ADXL202E was disabled with the PCB that we used to mount it. Therefore, we turned to the MAE department, where we were able to borrow a 1024CPR (cycles per revolution) optical shaft encoder from MAE478’s feedback lab. Rather than using the encoder’s shaft as the pivot, we decided to use an approach that would put the least amount of stress on the delicate piece of equipment. The encoder was placed in parallel with the pendulum’s bracket. The height of the encoder’s shaft was aligned with the pivot, effectively creating an imaginary line from the pivot to the encoder’s shaft. Finally, a pin was attached to the shaft of the encoder, with plastic tie-wraps, and connected to the pendulum’s bracket. The bracket had a 0.096” hole drilled above the pivot such that the pin would fit tightly, without slipping; therefore, when the pendulum moved, the encoder’s shaft rotated (See Figure 3, Image 3 and Image 4). Once the unstable pendulum was assembled and mounted on the car, an electrical circuit had to be designed to accept information from the optical encoder, process the information, and then control the vehicle in forward and reverse motion. We did not need any radio control circuitry or turning capabilities for our design; therefore, the car’s motor lines were separated from the rest of the manufacturer’s circuitry by clipping the wires leading to the motor. Applying a potential to the motor leads will cause the motor to spin in one direction, while reversing the polarity on the leads will cause the DC motor to pin in the opposite direction. To control the car’s forward and reverse motion, we required a simple 4-switch device (See Figure 1) that would ensure protection against a short of the DC supply, that is, switches 1 and 4 or 2 and 3 could never be closed at the same time. To operate the motor in one direction, simply close switches 1 and 3; for reverse operation, open switches 1 and 3 and close switches 2 and 4. To stop the motor completely, simply open all switches. Once the hardware to drive the motor was identified, we moved to creating a stand-alone board such that all controls would be on the vehicle. Using a 6” x 2-1/16” Perf Board, we began laying out the necessary components for the Atmel Mega32 microcontroller to run without the STK-500 development board. Our initial board used a single 12V supply to provide power to both the MCU and the motor. A Texas Instrument UA7805CKCS voltage regulator was used to bring a regulated 5V to the MCU. A 0.1 µF capacitor to ground was placed on each side of the regulator to block any noise on the line from resetting the MCU. A 16 MHz crystal was placed across XTAL1 (pin 13) and XTAL2 (pin 12), with a 27 pF capacitor to ground at each pin. Finally, a 2x3 header was used to allow for In-System Programming of the Mega32 (See Figure 2). The Vcc line in the ISP header was disabled. Connecting the ISP’s 5V line, which brings in Vcc from the STK-500 during programming, to the MCU’s regulated Vcc line, which comes directly from the 12V power supply, could lead to the two supplies fighting each other if they were both on at the same time. Therefore, we decided that the best option would be to disable the ISP’s Vcc line, and always use our 12V supply line. This, however, required the board to be powered externally when programming. The MISO (ISP pin 1), SCK (ISP pin 3), MOSI (ISP pin 4), ~Reset (ISP pin 5), and Ground (ISP pin 6) lines were connected to the MCU’s pins 7, 8, 6, 9, and 11 respectively to complete the In-System Programming setup. Finally, we dedicated PORTD.4, D.5, and D.6 on the MCU as the 3 motor control signals; Break, PWM, and Direction respectively. Adding the optical encoder to the circuit was the final step in the hardware required to balance the pendulum. Output channels A and B from the encoder (pins 3 and 5 respectively) were used to trigger external interrupts on PORTD.2, D.3 respectively. The encoder was connected to the circuit using a 1x5-pin header, which delivered +5V, ground, and Channels A and B lines from the MCU to the encoder. (See Figure 2, J4) Turning on the power seemed the only thing stopping our circuitry at this point. Once our software was ready to be tested, problems with the hardware surfaced almost immediately; the most drastic being noise issues orignating from the motor. Since only one power supply was used (12V to the motor and regulated to 5V for the MCU), noise created when the motor would change directions would travel down the ground line and reset the MCU, which had an absolute maximum rating of 200mA DC current on Vcc and ground pins. Physically separating the ground lines (but all leading to the same supply ground) did not help. This was further seen when tested using the STK-500 and a separate H-Bridge on a prototype bread-board circuit. Since noise kept resetting the MCU and the only line connecting the STK-500 to the H-bridge was ground, an isolated ground scheme had to be used. Therefore, we went from a single supply design to two supplies, 5V to power the MCU and the encoder, and 12V strictly to power the motor. To completely isolate the motor circuitry, which only consists of the H-Bridge, from the MCU, three 4N35 opto-isolators are used to detach the three MCU lines (break, PWM, and direction) from their H-Bridge counterparts. This device uses an infared diode to turn a phototransistor on and off. When current passes through the diode, the transistor is essentially a closed switch, shorting to ground in our application. When the photodiode is off, the transistor is an open circuit and the output is high, 12V though a 1 kOhm pull-up resistor. Since the 12V power supply is not regulated and usually outputs around 14V, two LED’s in series were placed between the 12V supply and the pull-up line to bring the voltage to approximately 11V. 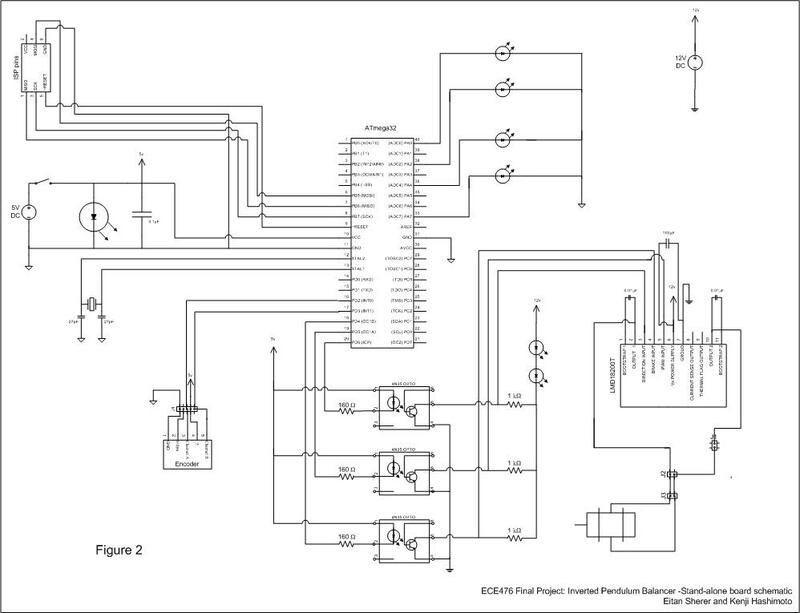 This was done because of the H-Bridge’s absolute maximum input rating of 12V on pins 3,4, and 5. The opto-isolator is an inverting device, therefore, rather than inputting a signal referenced to ground, we used 5V as the input and referenced it to each of the three signals. Once the signals are inverted through the opto-isolator’s transistor, the correct signals are passed to the H-bridge, with exception that a logical high is 12V rather than 5V. Since the opto-isolators use phototransistors that receive IR signals, there is no physical connection between the MCU's circuitry to the H-bridge. Therefore, no noise from the motor can go to the MCU. Adding the three opto-isolators made board layout very tight. Therefore, only one power switch is used. The switch controls MCU power, while 12V motor power is always connected. It is worthy to note that if no input signals come in to the H-Bridge, the motors do not run. Both power supplies are connected to the board with two-pin headers. The complete separation of grounds between the motor and MCU solved all noise issues, and allowed for high-speed motor transitions without MCU reset. Program Design - There are three main functions in the final controller code: sensor (encoder) input, PID control calculation, and motor control output. The motor controller code (test_motor.c) was written first. The DC motor is controlled via a H-Bridge and three signals control the break (on/off), speed, and direction of the motor. These signals were outputted from the pins on Port D of the microcontroller to pins on the H-bridge. The speed of the motor is controlled by a pulse-width-modulated (PWM) signal. The current delivered to the motor is proportional to the pulse-width, thus the percentage of duty-cycle period determines the speed of the motor. Since we did not know at what frequency to output the PWM signal and how sensitively the duty-cycle period would affect the speed of the motor, we wanted to write a motor driver code that could change both the PWM signal frequency and duty-cycle period with ease. For this reason, we picked Port D of the microcontroller. The OC1A (PD5) pin on port D can serve as an external output for Timer 1's Output Compare mode. The "Fast PWM Mode" operation on Timer 1 provides a high frequency PWM waveform generation. The counter for Timer 1 is incremented from zero to TOP then restarts from zero. The OC1A is set (pin is set high @ 5V) when the counter reaches the TOP value. The OC1A is cleared (pin is set low @ 0V) when there is a compare match between the counter and OCR1A register. 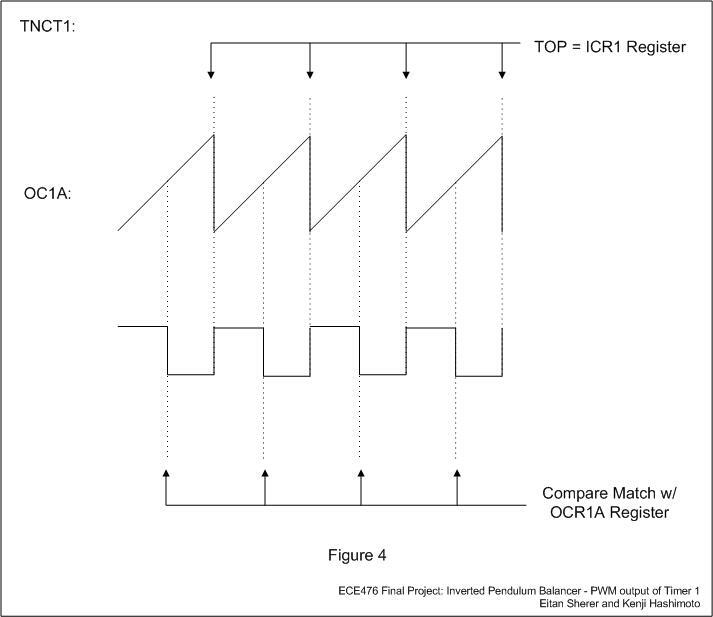 Thus, the TOP value of the counter (along with the clock prescaler value) determines the frequency and the OCR1A register value determines the duty-cycle period of the PWM signal being outputted (See Figure 4). In "Fast PWM Mode" of the 3 timers on Mega32, only Timer 1 allowed to set the TOP value in ICR1 register instead of fixed values. This allowed for variable frequency of PWM signal. OCR1A and ICR1 registers are both 16-bit registers, thus the values had to be set using two write operations, with the high byte always written before the low byte. Two unsigned integer global varialbes, motor_PWM_period and motor_PWM_duty were declared. The function motor_updateDuty() set the high and low bytes of motor_PWM_duty to OCR1AH and OCR1AL respectively. The function motor_updatePeriod() set the high and low bytes of motor_PWM_period to ICR1H and ICR1L respectively. To test the frequency and the duty-cycle period of the PWM signal driving a DC motor, test code (void test_speed()) was written which utilized the pushbuttons on the STK-500 development board. Two buttons were defined to increase or decrease the value of the ICR1 register, which in effect increased or decreased the frequency of the PWM signal. Two buttons were defined to increase or decrease the value of the OCR1A register, wihch in effect increased or decreased the duty-cycle period of the PWM signal. When changing these register values, the code had to check that the value of OCR1A was less than the value of ICR1. If the OCR1A value became larger than the ICR1 value, a compare match between the counter and OCR1A would never happen because the Timer 1 counter would reset to zero at ICR1 value. One button was defined to toggle the direction signal and another button was defined to toggle the break signal. Using this implementation, we found that setting the ICR1 value to 300 is sufficient for controlling the motor. This was equivalent to having 208.3Hz PWM signal ((16e6Hz/256)/300=208.3Hz). Next, we developed a function (void motor_controller()) in the motor test code, where we planned to accpet the output of the PID controller. The PID calculation would use the angle of the pendulum to calculate the speed at which to drive the cart. The sign of the error would determine the direction of the movement of the cart. The function, motor_controller(), accepts the output of the PID calculation and sets the speed (duty-cycle period), direction (sign of the PID output), and duration of time for which to go at this speed. After these parameters are set, the break is turned off (set low) and waits until the timer runs out. When the timer runs out, the break is turned on (set high) and the function ends. It is important to note that the duration of timer determines the rate at which the PID calculation is performed. After the function ends, the code goes back to the PID calculation (see Figure 5) where error of the angle is used to calculate the new speed and direction. Using this new function, we tested how quickly the cart can oscillate. The test proved that the cart was capable of changing directions fast enough, the character behavior that we suspected that would be required to balance an unstable pendulum. After we decided that an optical encoder would be a better sensor for measuring tilt than an accelerometer, we wrote the sensor controller code. The encoder converts real-time shaft angle, speed, and direction into two channel TTL square wave outputs with index pulse. The resolution is 1024CPR (cycles per revolution), or 1024 cycles per each 360 mechanical degrees of shaft rotation. The square wave is outputted on both channels once per cycle. When the shaft is rotating in a clockwise rotation, channel B leads channel A by ¼ of cycle period, and when the shaft is rotating in a counterclockwise rotation, channel A leads channel B by ¼ of cycle period. The index pulse also outputted once per cycle when both channel A and channel B are low. (See Figure 6) By keeping track of which one of the two channels goes high first, we can keep track of the rotation of the shaft. By measuring the timing between rising/falling edges between Ch. A and B square wave outputs, we can calculate the speed of the shaft's rotation. We, however, do not care about the velocity of the shaft's tilt so it was not calculated. On the other hand, we do care about the angle of the shaft, which can be kept track of by counting every cycle that the encoder outputs. To get the MCU to process all the data outputted from the encoder turned out to be a tricky task. 1024 cycles per revolution translates into 360/1024=0.35 mechanical degrees per cycle. For every 0.35 degrees, the encoder outputs two square waves and an index pulse. The first attempt at trying to count each encoder cycle with the MCU utilized the External Interrupt pin on Port D (D.2) connected to the index pulse output of the encoder. The external interrupt service routine was setup to be triggered on every falling edge of the index output. According to the specifications of the encoder, one of the channels would go high at most 300ns after the falling edge of the index pulse. Since it takes approximately 35 cycles to enter an ISR (~2e-6 or 2µs), the voltage on channel A and B are checked at the beginning of the ISR. If one of the channels is high and the other is low, we know the direction of the rotation and can increment/decrement the counter accordingly. With this implementation, the counter seemed to work well when rotated fast but not slow in one direction and when rotated slow but not fast in the other direction. This was probably due to the fact that the ISR was triggered on a falling edge and that the channel's levels were changing too fast compared to the ISR duration. After painful attempt at debugging this implementation, we decided to try another implementation with two external interrupts (INT0/D.2 and INT1/D.3) connected to the two channel outputs of the encoder. The external interrupt service routines were triggered on every logical level change. During the ISR for Channel A, the 0th bit of the global unsigned char variable sensor_channel would be toggled. During the ISR for Channel B, the 1st bit of the sensor_channel variable would be toggled. After each bit toggle in each ISR, the value of the sensor_channel variable would be checked. If the value of sensor_channel equaled 1 (0x01) in the ISR for Channel A, it would imply Ch.A was leading Ch.B, thus counter-clockwise rotation of the shaft. If the value of the sensor_channel equaled 2 (0x02) in the ISR for Channel B, it would imply Ch.B was leading Ch.A, thus clockwise rotation of the shaft. For every cycle of clockwise rotation, the counter variable, sensor_index, was incremented by one and for every cycle of counter-clockwise rotation, the sensor_index variable was decremented by one. This implementation worked like a charm for various speed of rotation in both directions. The sensor_index variable was declared as an unsigned char, because we knew that once the pendulum was mounted on the car, the range of the pendulum would be less than 90 degrees (1024/360*90=256). The sensor_index was initialized at 128 so that the counter can count up to 45 degrees in both directions. Once the sensor input and the motor output codes were tested independently, the two logics were merged together and tested first without the PID calculations (controller.c). This code was used to drive the motor with manual rotation of the encoder shaft. At reset of the program, the motor is not driven with any voltage. When the shaft is rotated for more than 15 degrees in one direction, the motor was driven in one direction. If the shaft is brought back to the original position, the motor was stopped. If the shaft was rotated for more than 15 degress in the other direction, the motor was driven in the reverse direction. Using this code, we assured that the the sensor input and motor output logic were working together. Implementing the PID control calculation was pretty straight forward (balancer.c). The proportional (kp), integral (ki), and drivative (kd) constants were defined at the beginning of the code. It is worth noting that the delta t values in the PID equation are absorbed into these constants. In the pid_controller() function, the error of the angle is calculated by taking the difference between the sensor_index value and the init_sensor_index value. At reset of the program, the sensor_index is initialized to the init_sensor_index value and is constantly updated via external interrupts from the encoder. This error, which can be positive or negative value, is then used to calculate the prorportional, integral, and derivative terms. The variables are cast to float for these calculations because the constants could be decimal values. The three terms are added, the sign of the sum determines the direction, and then its absolute value is taken. This newly calculated value is the speed of the motor, or the percent of duty-cycle period of PWM signal. This value is checked against the max_motor_duty variable, and is changed to its value if it exceeds the value. This is to ensure that the duty-cycle period of the PWM signal never exceeds a predefined threshold (at most 100 percent). The new calculated value is then passed on to the motor_controller(). The flow of code is diagramed in Figure 5. In order to prevent the car from moving at high speed in one direction when the pendulum completely fell to one side, a safety feature (safty_check()) was implemented at the end of each PID calculation cycle. The safety_check function has two saftely check features. The first feature checks the angle of the pendulum tilt (sensor_index) and if it exceeds approximately 40 degrees from the reference point, then we assume that the cart has no chance of balancing the pendulum again and stops the motor operation. The second feature checks if the cart moves above a predefined speed (safety_speed) in one direction for a period of time (safety_timer). This part of the safety feature is to ensure that the safety does not solely rely on the angle reading of the pendulum from the encoder. The pendulum can be initialized at any angle, so the motor can be operating at high speed even if the MCU does not register the angle of the pendulum as having fell to one side. The PID constants were determined through systematic trial and error. Initially, the integral and derivative terms were set to zero and the proportional term was gradually increased until the system went unstable. Once we knew the maximum proportional term, we added the derivative term to smooth the oscillation of the cart. The integral term remained at zero because the oscillation caused by the integral term caused the balancer to behave poorly. We run the balancer by starting off with the pendulum balanced. Setting all initial conditions to zero allows the encoder to initialize upon reset and create a reference angle. A light tap to the top of the unstable pendulum is all that is required to start the balancing process. The balancer quickly adjusts itself to recover the error in the angle. The pendulum successfully completes 5-7 recovery periods on average before the motor/car characteristics inhibit the quick response needed to recover the angle. The initial balancing proves that the problem of the inverted pendulum balancer can be solved, yet our mechanical limitations, namely poor motor/car performance (gear train slippage and soft-wheel slippage with the floor, which creates delay in the system as shown below), keep us from the ultimate feat of infinite balance. 1) Connect 5V and 12V power lines to correct pins on the circuit board. 2) With both power supplies off, balance the pendulum on the car. 3) Turn on the 12V supply to power motor. 4) Turn on the 5V supply to allow initialization of encoder. 5) Gently tap the top of the pendulum in any direction. The device will not interfere with any other device in the room. The only high-frequency device on the board is the 16 MHz crystal, whose leads are short with capacitors to ground, to keep all noise at a minimal. The RF circuitry of the RC car is disabled so as to not interfere with anyone else’s circuitry, let alone our own. Finally, the PWM signal is at such a low frequency (208.3 Hz) and passes through shielded cable such that it would not radiate to interfere with anyone else’s circuit. Note: These frequencies are not the same as those being transmitted by students with RF projects. This virtually ensures no interference between projects. The metal rod used as a pendulum can create a dangerous situation when placed on a moving vehicle. Therefore, we request that all observers respect a 10’ safety zone. In addition, a software safety feature is implemented to apply the break to the motor if it travels in one direction for more than 2 seconds without changing directions or if the MCU processes that the pendulum has fallen more than 40 degrees. Assuming the budget constraint is not removed, we would choose our car more carefully, and base the decision not only on response but also on mechanical design and stability (rocking, suspension, etc). The pendulum would be reinforced such that movement would be restricted to the vertical plane, with no rotational movement in the pendulum, which causes excess pressure on the encoder and possible erroneous sensor readings. Our entire design process revolved around what we had learned in MAE478. Towards the end of the semester (and the end of the project), the feedback course began moving from system analysis to controller design and system modeling. Using techniques that we had learned towards the end of the semester in the initial design phase (in the middle of the semester) would have certainly created a more robust and precise controller. The ability to model the mechanical system, to use grey-box analysis (rather than black box analysis), and apply bode plot and root locus design to create dominant poles and zeros that make the system perform the way we want it to would also have made for a more fulfilling design process, where more knowledge between the two courses could be integrated. Finally, the noise issue was dragged out for about 4 days while we tried quick fixes to our original board. The minute this problem was observed and the noise on the ground line viewed with the oscilloscope (which showed very high noise spikes around 1V in amplitude), the new board design (with isolated MCU and motor circuitry) should have been adopted. This would have given us more time to fine-tune the PID controller and maybe smooth out some mechanical bottlenecks that prevented us from longer balancing time. Throughout the project, our one worry was that the car/motor’s response was not good enough for our desired task; this was in fact true. The car could not balance the pendulum indefinitely. Slippage, originating in both the gear train and the soft tires (in contact with the floor), would create a delay in our system that eventually drove it to instability. The delay made it impossible for the car to catch up, even though its velocity computations were correct. However, while we could not balance the pendulum indefinitely, the limited balancing achieved our main objective, which was to balance the pendulum. The amount of time for which we balance is out of our hand with our current budget, yet the prototype clearly shows that the project can be done, albeit with quality parts. We are confident that by using our circuit and logic on a more sound mechanical setup and obviously adjusting PID parameters, the system can achieve the ultimate feat of indefinite balance. All aspects of the design were our own. Of course ideas were taken from MAE478’s feedback control labs, yet they were not implemented in the same fashion. In addition, we did request outside help from persons with a Mechanical Engineering background in our vehicle/pendulum design. The code and circuit implementation of the design were our own. We did not have time, however, to fabricate the stand-alone board. Since we needed a prototype anyway, a perf board circuit was made and after numerous hours of soldering and debugging the two different circuits (single vs. dual power supplies), we decided that time would be better allocated in fine-tuning the PID controller rather than fabricating a board. Despite the short timeframe of ~1 month and the mechanical hurdles encountered, we are pretty happy with the amount accomplished. The project was a continuous learning process and it turned out to be one of the most rewarding experiences at Cornell. 1. To accept responsibility in making engineering decisions consistent with the safety, health, and welfare of the public, and to disclose promptly factors that might endanger the public or environment. Our inverted pendulum balancer can be a hazard to others standing within the immediate vicinity of its path of motion. To that end, we request that all observers maintain a 10’ safety distance even with our 2 Sec. motor safety check, that is, if the motor is rotating in the same direction for more than 2 seconds, or the pendlum reaches an angle greater than 40 degrees from reference, a safety stop is executed. 2. To avoid real or perceived conflicts of interest whenever possible, and to disclose them to affected parties when they do exist. During the Spring 2003 semester, another group attempted to balance the inverted pendulum. While some may find it in our interest to see our project succeed and out-perform theirs, our philosophy was to help all groups with any questions they might have. Therefore, we fully disclosed our method of angle detection to the other group. We recommended to them that their potentiometer method may not have enough resolution to detect an accurate angle error, and that they may want to borrow an encoder from the MechE. Dept.. In addition, we showed them how to isolate the motor from the MCU with optoisolators. There was no claim of time-frame which the pendulum will balance. We succeeded in balancing, yet could not achieve the ultimate task of infinite balance due to the inferior motor/car. 4. To reject bribery in all its forms. There was no bribery involved in our project. No person had anything to gain by our successful completion of the inverted pendulum balancer, nor did we have a motive to bribe any person as our project worked and we were under budget. 5. To improve the understanding of technology, its appropriate application, and potential consequences. Through our website, we hope to have the ability to reach all those interested in basic feedback control and practical engineering using microcontrollers and various salvageable parts. 6. To maintain and improve our technical competence and to undertake technological tasks for other only if qualified by training or experience, or after full disclosure of pertinent limitations. The entire project was a learning process. Our technical competence improved with every line of code written, every IC soldered. From identifying the special features of the Atmel Mega32’s PWM capabilities, to understanding how to isolate a noisy motor from a sensitive MCU, we learned from each mistake made. Criticism of our design was always welcome. Many people thought of different ways to make our pendulum balance longer. Most ideas, however, were contrary to all understanding of balancing an object easier. Yet some criticisms were very helpful. For example, Prof. Land’s help in isolating the motor from the MCU was probably the most helpful step in moving from separate motor and encoder testing, to motor, encoder, and MCU integration. 8. To treat fairly all persons regardless of such factors as race, religion, gender, disability, age, or national origin. This project shows that two people of different religion, disabilities, age, and national origin, can work together to achieve a common goal. 9. To avoid injuring others, their property, reputation, or employment by false or malicious actions. At no time did we perform any malicious actions towards any group in the ECE476 lab. This directly relates to the conflict of interest code mentioned above. We did, however, encounter malicious acts towards us, where someone (accidentally or purposefully) knocked down our accelerometer with Op-Amp daughter board and stepped on it. Luckily, we switched to the optical encoder and did not need the accelerometer. As mentioned above, any persons in the ECE476 lab that came to us for help, be it with motor questions or stand-alone board issues, received our help promptly and courteously. Mr. Beny Sherer for help with mechanical assembly and various advice. Mr. Eryk Nice for lending us the encoder and helping us with PID control. Professor Bruce Land for all the advice and support. All our friends and family for putting up with our complaining.